Child trafficking and the commercial sexual exploitation of young children remain common phenomena in Madagascar. Thousands of families face food shortages and incapacity to cover the most basic needs as household incomes continue to decline. Madagascan children clearly represent the most vulnerable segment of population. In order to help and protect them, SOS Children's Village decided to become active in 1986. The work of our organisation in Madagascar began in 1986 when the national association was founded. We started working in Madagascar in 1988. Over the recent years, the SOS Children's Village has kept growing as new programmes have been added. Since 2002, we have been running SOS Family Strengthening Programmes which aim to enable children who are at risk of losing care and protection of their family to grow up in a caring family environment. When children can no longer stay with their families, they are cared for by their SOS mothers in one of the SOS families. At present, we are supporting Madagascan young people and children in three different locations by providing day care, education, medical services and vocational training. The world's fourth biggest island is situated just off the East-African coast. The country is home to around 21 million people of mixed Asian and African origin, many of whom live in crippling poverty. Due to its geographic location, Madagascar is frequently hit by natural disasters. In 2000 and in 2004, tropical cyclones caused heavy flooding, leaving thousands of Madagascans homeless. Major export commodities include vanilla, rice, cocoa and coffee. In spite of the fact that Madagascar is a potentially prosperous country, blessed with fertile soil, minerals and oil reserves, it remains one of the poorest. The vast majority of the country's population have not been able to participate in Madagascar's increased wealth. The socioeconomic conditions that the majority of Madagascans face are harsh: Since the early 1970s, the per capita income has fallen noticeably while during the same period the population has nearly doubled. The Madagascan population has been growing at rapid pace. In fact, it is among the fastest growing in the world. Social exclusion, poverty and suffering can be observed everywhere in the country. Around 67 per cent of Madagascans have to live on less than 1.25 US dollars per day. While urban poverty also exists, poverty in Madagascar is predominantly a rural phenomenon: the rural population lacks access to public infrastructure and services, in particular medical centres and schools. What many Madagascan subsistence farmers produce is barely enough to feed their own families. Tens of thousands live a life in isolation. Nearly 60 per cent of the population do not have access to drinking water. As a result, many Madagascans find themselves forced to consume unsafe, polluted water, which in turn increases their risk of contracting cholera or chronic diarrhoea. Particularly children under five years of age are affected by water borne diseases. The country is characterised by a fairly high fertility rate of 5.02 children born per woman. Rapid population growth continues to have a negative impact on child malnutrition figures as food shortages in certain areas are already chronic. 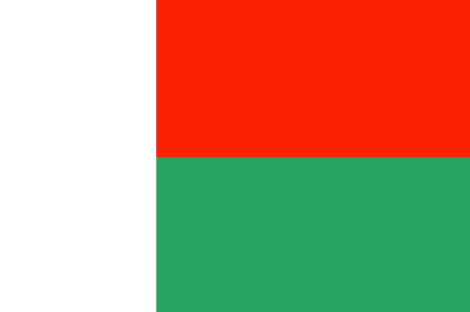 Demographically speaking, Madagascar is a fairly young nation: Around 44 per cent of the population are less than 14 years old. Many children grow up without parental care and protection. In the streets of the capital, thousands of young Madagascans roam the streets begging, engaging in child prostitution, cleaning car windows or selling merchandise. While in most African nations HIV/AIDS tends to be the major reason that drives children into orphanhood, figures show a rather different picture for Madagascar. Out of a total of 910,000 orphans, 11,000 children have lost their parents due to AIDS. Although the infant mortality rate has dropped significantly since the early 1990s, it is still high at 51 per 1,000 live births. Although primary school enrolment has increased significantly over recent years and is now at 98 per cent, the Madagascan education system is marked by generally high drop-out and repetition rates. Lack of funds, further aggravated by the EU foreign aid freeze policy, and discontinuity in educational reforms pose a threat to the adequate education of children. After donor funding came to an end in the wake of the military coup in 2009, many poor families now have to pay either partially or completely for the primary school education of their children. Child labour is an issue tightly associated with the problems in the country's education sector. Although the government of Madagascar has introduced laws to combat many of the worst forms of child labour, the problem persists. Thousands of children between 5 and 14 years of age work in agriculture. Children as young as eight engage in the production of wine, tea, cocoa, cotton and vanilla. Many of them have to use dangerous machinery and inhale toxic fumes on a daily basis. Child domestic servants work 12 hours a day or more. Most of them never receive a salary. The commercial sexual exploitation of young boys and girls, particularly in tourist areas, is a sad reality in Madagascar. Additionally, human trafficking and in particular child trafficking has become a common phenomenon in Madagascar. It is a source country for both domestic and international trafficking. Young girls are recruited near airports and are trafficked abroad, where they have to work in private households.